If you are looking for a company to dismantle, breakdown and remove you old swing set or play set thenJunk My Trashis the right company for you. We have all the tools and state of the art equipment to get the job done quickly and with ease. We will safely remove your old swing set and/or play set without damaging your property. We always clean up the mess left behind too! 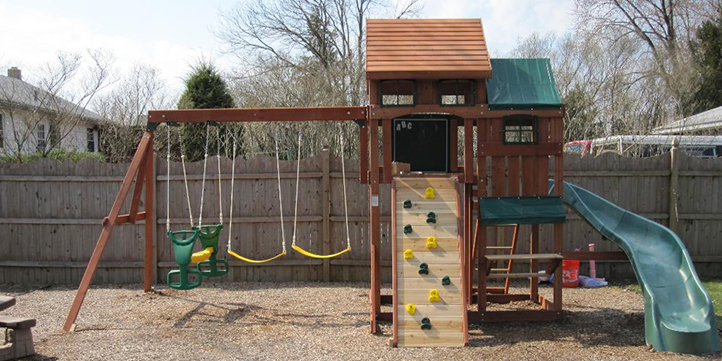 Getting rid of any play set or swing set can be frustrating and time consuming. Not to mention all the bulky debris left behind. If left for too long these cans then become an eye sore or even worse, a perfect harborage or shelter to local pests. There is no need to let the mess pile up. One call clears it all! Just call us and schedule a free on site quote. 866-544-5865. It can be hard to let go of the swing set and play set where you children once played and created all the wonderful memories. But as some point, it has to go. Or you might be a new homeowner who got stuck with the swing set or play set you don?t need. The Junk My trash professionals are discrete and courteous. You can expect to get the service you deserve. Don?t let that valuable space get misused or even left unused. Call us now and let us clear it all! 866-544-8565. If the play set is in good condition,Junk My Trashwill dissemble it and donate it to someone who can use it or hand it over to a donation organization which will find a person who can use it and not let it go to waste.